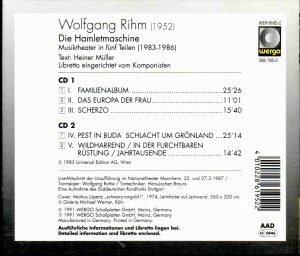 I bought this disc years ago, but set it aside because I first wanted to read the lengthy “explanations” given by the composer in the liner notes, and since his expression is so complex and gnarled, I wanted to try and read it in the original German (with the help of the translation, to be sure). Never found the time back then. Well, all those years haven’t helped, and Rihm’s presentation remains as intractable as before. From that I conclude that composers aren’t always well equiped to explain their works – and no one asks them to anyway. The process of composition derives from inarticulate images, notions, feelings, desires, impulses, that words can hardly describe. What is asked of the composer is to compose, not to explain. 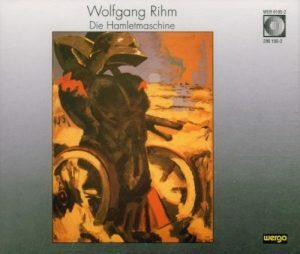 It is Greek-French composer Georges Aperghis’ own setting, completed in 2000, [die hamletmaschine-oratorio], that sent me back to this recording of Rihm’s (the live recording of the premiere, made in Mannheim in March 1987). No wonder that “Die Hamletmaschine”, by East-German writer and dramaturg Heiner Müller (1977), has inspired these composers. What this text exactly is is hard to tell. Although its point of departure is Shakespeare’s play, and although it is regularly staged, it is certainly not a play in the traditional sense, with conflicting characters and psychological relations. There are no such characters anyway, although Hamlet and Ophelia (but also Electra) are invoked. It is more an elaboration on some theatrical (and political) myths. But certainly, it is a cryptic, wild, unruly flow – a flood even – of words and violent images. You can hardly associate the – very serious and stern – image of Heiner Müller with the notion of “punk” and “trash”, but this is what it is. There is another obvious link from Rihm to Müller’s Hamletmaschine, and that is by way of Antonin Artaud, the French half-nut writer and playwright, the inventor of the concept of “Theatre of Cruelty”. In those years Rihm had already set Artaud’s dramatic ritual-poem Tutuguri as an orchestral-vocal ballet, and he came back to Artaud with his opera Die Eroberung von Mexico (The Conquest of Mexico). Artaud is also one of the concealed but direct references of Müller’s Hamletmaschine. Same logorrhea, verbal violence, vociferations. It is interesting to compare Aperghis’ and Rihm’s setting. Aperghis turned out a composition that is gnarled, wild, unruly, much more than what he usually does. Rihm’s is even more. He has the “role” of Hamlet shared between three performers: one old actor, one young actor and one baritone (Aperghis has two baritones plus a viola player and a percussionist also acting as speakers). Like Aperghis, his Ophelia is attributed to a dramatic high soprano. There are also three Ophelia doubles and the roles of Marx, Lenin and Mao given to coloratura soprano, soprano and mezzo. I appreciate that Rihm doesn’t let himself be bound by the fetters of “good taste”. He has his speakers vociferate and eruct. There are also some nice, original touches in his writing for the three men, as in the passage at 12:45 in the 4th movement where (apparently departing from Müller’s text) he has them intermingle syllables from “coca cola” and “Ekel” (disgust). His music is in a quasi constant state of pounding paroxysm, with a massive and gnarled orchestra (Aperghis uses a gnarled but more gossamer instrumental ensemble), and hardly any moment of repose. It is impressive, but I am doubtful that it is entirely effective. Dramatic architecture has to do with changes of rhythm, articulation between acceleration and repose, surprise. You don’t have much of that here, and over 90 minutes of paroxysm becomes somewhat tedious. There are occasional quotations, Haendel, whiffs of Romantic music, one of Tristan I think, dance music. They don’t add much. Where I don’t find Rihm entirely successful either is in his vocal writing for baritone: often too traditional, smacking of Berg’s Wozzeck. Aperghis is more inventive here. One more point: there are passages where Müller, for no obvious reason, writes his text in cap letters. Aperghis gives these passages to the chorus. Rihm doesn’t even address the issue and does nothing of them: the baritone sings them as if they were in normal text. As for the chorus, it is limited to a subservient role, an occasional background commentary (oftentimes close to unintelligible). As with Aperghis, it is sometimes imbued with a pained lyricism which evokes Nono. Likewise, unlike Aperghis, Rihm doesn’t write a vocal line for Müller’s numerous stage indications. For instance, stage indication to Part 3 “Scherzo” starts with “University of the Dead. Whispers and buzz”. So Rihm dutifully has his chorus whisper and buzz – and it is quite effective (could come out of Penderecki’s Utrenja). But the stage indications continue on 15 more lines of the CD booklet (“from their gravestones (lectern) the dead philosophers throw their books at Hamlet” etc. ), with only three short lines of “text”: one by Ophelia, one by Hamlet, one by the “Voice(s) from the coffin”. You are free to imagine the actions described in the stage indications from the orchestral music Rihm has composed, but truth is the music isn’t really descriptive or evocative. Aperghis has the full text shared between speaker and chorus (with minimal orchestral accompaniment), and I thrink that he is again basically right here in assuming that in a text like Müller’s, those stage indications shouldn’t be construed as “traditional” ones for the director, but as an integral part of the “play”, and should be spoken or sung. In sum: extreme, paroxysmal, flawed. The Müller text is given in Deutsch only (but translations can be found on the net).